Water Reuse generally refers to the process of using treated wastewater (reclaimed water) for a beneficial purpose. The degree of treatment depends on the proposed use for the water. There are two major categories of water reuse: direct reuse and indirect reuse. Both categories can be used for potable purposes. 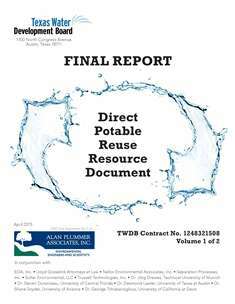 Examples of direct reuse for non-potable purposes include using piping reclaimed water to golf courses to irrigate, industrial center for manufacturing, and power plant for cooling purposes. Testing Water Quality at the Raw Water Production Facility in Big Spring.